My aim is to keep to the key points of each character with as little spoilers as possible. Just as a precuation some of the points raised could be story or plot related. All characters belong to their respected owners; this page isn’t to discredit their creation but to give an alternative point of view into each character. Likewise, this isn’t to devalue dyspraxia in any way but give it an alternative understanding. Feel free to comment your thoughts but if you’re ready let’s crack on! This is my current list of potential characters to date; order of highest to lowest score (some scores are more equal than others). The characters who don’t score favourably are included, as it would be unfair to simply dismiss them purely based on my opinion. I may bring up positive traits but only for character building and doesn’t impact the score. Ah, Mr. Bump and Little Miss Whoops; the cartoon embodiments of clumsiness – there isn’t enough space to list all of their accidents. From tripping over, knocking over things, bumping into other people, etc. These siblings get into all sorts of accidents on a regular basis – it is in their name after all! Other things to note are; getting lost, breaking things, and having problems with coordination. In his book, we get to see that Mr. Bump is a good problem solver and can turn his disadvantages into an advantage. In my opinion, if dyspraxia had a cartoon personification it would turn out something very much like Mr. Bump or Little Miss Whoops. We do get a slightly better insight into Mr. Bump than Little Miss Whoops, but they’re both the same kind of character so they get the same score. Warrior is clumsy and accident-prone throughout the entirety of the Tugs TV show. He is the first character I ever theorised could have dyspraxia. Warrior has all the other characters in the series beaten when it comes to accidents. On the positive side, he has demonstrated that he can come up with creative ideas and has a very strong will, especially to put things right if he makes a mistake. Warrior being non-human makes it difficult to draw up more comparisons though. The show lasted 13 episodes, so there isn’t much on the character development side. Extra reading: I go into more detail about Warrior on my post here: http://www.dyspraxicfantastic.com/post-109-warrior-the-clumsy-tugboat/ if you wish to read more. No surprises that she has a few mishaps in the game; dropping things, bumping her head, and bumping into another character. + Bedroom is constantly messy. + Is terrible at cooking (and almost started a fire accidentally). + Struggles with managing money. + Late meeting the main character (happens often). + A messy eater (possibly). + Has a low attention span and gets distracted easily. + Messy attire ~ Blazer unbuttoned; Top buttons of her shirt undone, with a crooked collar; Slightly skewiff ribbon. + Had a potential dyspraxic morning ~ dishevelled hair; a displaced bow; and toothpaste on her (crooked) collar. + Breaking a plate (which acted as her introduction to the series). + Breaking things in general. + Falling down/over things which include falling over the same umbrella stand on more than one occasion (in the film she simply stumbles over the umbrella stand). Tonks has admitted to being clumsy in the past, so it is something that happens to her regularly. She has the unusual gift of being a Metamorphmagus, which is having the magical ability to change her physical appearance at will, unaided by a potion or spell. This gift isn’t linked to dyspraxia (at least as far as I know!) but she can lose control over this power when she gets emotional (such as angry or sad) which results in her hair changing colour. Hair spontaneously changing colour isn’t a dyspraxic trait either, but the very notion of difficulty controlling ones’ emotions is for sure. She has also suffered from depression at some points, which is linked to events happening in her life, but those with dyspraxia are more prone to bouts of depression. Tonks tripping in the film – her and Kingsley’s reactions are ones I know all too well! Personality wise, she is a Hufflepuff. She is an inquisitive person with enthusiasm and has an incredibly strong will. She is fiercely loyal to those around her and is one to help brighten the mood and cheer people up during bleak times. With all these elements combined, Tonks stands out to me as someone who is the best contender in the Harry Potter universe as having dyspraxia. There’s just one shred of doubt that stops her scoring any higher which is her Metamorphmagus ability. With the ability to change physical appearance this could impact spatial awareness due to not constantly having the same body all the time – as an example, being taller will make it so much easier to whack your head if you weren’t used to the height! We don’t witness Tonks doing normal activities so this makes it difficult to bring up any more comparisons – after all, she has magic to aid if she struggles with buttons and shoelaces, etc! J. K. Rowling hasn’t revealed if any of her characters have dyspraxia or not but with Daniel Radcliffe revealing his own dyspraxia, it created a golden opportunity for J. K. Rowling to reveal to us if any of her characters have dyspraxia. She hasn’t, yet, so we can come to our own conclusion for the time being. Tonks is in the Harry Potter: Hogwarts Mystery game at the start of the player’s 3rd year. This game isn’t canon but Tonks’ clumsiness has transferred across from the main series. It is up to you to decide whether these antics and accidents can count as supporting evidence. Early on in the series, it is clear that he isn’t a skilled wizard, but this probably down to a lack of self-confidence more than anything. It could well be a co-ordination difficulty but it isn’t confirmed or demonstrated so it is pure guesswork at best. Some theories state that it is his wand that is the problem and not directly him, which is an interesting idea and one that I can agree on. Harry Potter is a tricky one and I can understand why people may think he is dyspraxic. The actor, Daniel Radcliff, has dyspraxia so it wouldn’t be surprising if some of his dyspraxia traits find their way into the film. However, the book version of him didn’t leap out to me as being dyspraxic, after all, he did show an incredible amount of dexterity and coordination with no confirmed issues. His appearance of messy hair, broken glasses etc, which can be associated with dyspraxia, is obviously as a result of being kept in a dusty cupboard for most of his early life and the treatment from the people around him. In the film, there is a moment involving shoelaces but whether this is just creative licensing on the film part, a nod to the actor’s dyspraxia, or as a hint to something more about the character is debatable. For me, there is too much conflicting evidence for Harry to score high here. While on the subject of the Harry Potter universe and clumsiness I thought I bring up Errol – the Weasley’s lovable but equally clumsy pet owl. Errol has bumped, crashed, and has gotten lost on several occasions and this explained that it’s due to his old age and bad eyesight. However, despite the bad eyesight he seems to, for the most part at least, find his destination – in other words, he is an expert at crash landing in the right spot! I think there could be more to Errol than just old age and bad eyesight and while I am unsure if owls can have dyspraxia, I can say that I wouldn’t rule it out completely, but it is still fairly unlikely nevertheless. Because dyslexia and ADHD actually exist in this universe it can be safely assumed that dyspraxia also exists. This brings me to Tyson. I remember distinctly that Tyson had a lot of dyspraxia type moments that revolved around clumsiness and forgetfulness. Being a cyclops it can be argued that having one eye would explain problems with depth perception and the clumsiness but surely the brain of a cyclops would adapt to this unless there was something like dyspraxia afflicting this character. It’s a factor that does affect the score though. I watched this film once in the cinema (back in 2013) and came out convinced that he has dyspraxia. I even felt that in this film alone Tyson showed more dyspraxic traits than Percy showed dyslexic ones. Like many others on this list, he also showed a great deal of enthusiasm, determination, and a strong will. Once I get a better insight into this universe then Tyson’s score may change. Interestingly enough, I was going to write a post about Tyson and thoughts that he could be dyspraxic after seeing the film, however, I didn’t want to spoil the film as it had just come out I and wasn’t entirely sure how to tackle a topic like this. Many people believe Miranda has dyspraxia. Her clumsiness and awkward tendencies being her biggest prominent character traits (Far too many to list!). There are many people with dyspraxia that are able to relate to her and because of this, it is highly possible that she is dyspraxic. Miranda as a show has a very basic premise and doesn’t really involve much character development – it runs like a sketch in a sketch show, which makes it difficult to get the full picture of a character. At face value, she is one of the best contenders for dyspraxia on modern television. It’s also worth noting that in the show ‘Not Going Out’ Miranda Hart played a character called Barbara who was also clumsy and could well have been a precursor to the title character in this show. He certainly has a fair few of the tendencies such as the countless accidents, getting distracted easily, messy eater, etc. Not to mention he has a big heart and strong willingness at times. Generally speaking, Homer is a strong contender for a dyspraxia label, however, there was an episode which gives an insight into Homer’s persona. It’s the 9th Episode of the 12th Season titled ‘Homr‘. As a result, it is arguable if what Homer has is a form of Apraxia. 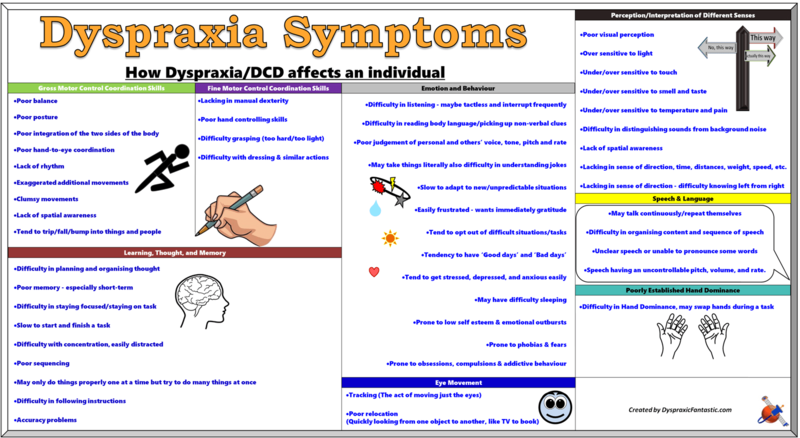 While dyspraxia is from birth, apraxia happens from a head/brain injury or stroke. Homer is a perfect example of why fictional characters, especially cartoons, are impossible to officially diagnose. Especially cartoon characters as they run off cartoon logic and not what we have come to expect in the real world. Still, this page is only a bit of fun and runs off its own rules here so characters like Homer do get a benefit of the doubt. It is not an exaggeration when Celica sense of direction is described as beyond abysmal – as even with a map she struggles, but it sure would help if she knew which way up to hold it! (It’s safe to say she has the worst sense of direction out of all characters on this page; which is probably an achievement of sorts.) She is also clumsy, but it doesn’t manifest itself that much in the story and is only noticeable during the fighting aspect of the game (mainly tripping over). Her tripping over is linked with specific attacks and combos, so while her clumsiness is natural it isn’t exactly organic. If she tripped over at random times then that would score some hefty bonus points. She is known for taking things literally and being naive/innocent at times. Overall, it seems to me that she’s a fair contender to being dyspraxic. + They’re a joke character. + It’s part of their fighting mechanics or style. When a character is clumsy during in-game moments it’s normally triggered on certain attacks and/or combos instead of happening randomly. With certain characters, they may show certain tendencies during the story elements but it is dismissed in the actual gameplay side. I still think it’s worth mentioning these characters even if they score low overall. Mostly because it shows I have considered them in the first place and leaves room to expand on in case more information comes to light. Mr. Bean is a difficult one. Some say he probably has dyspraxia and others say Aspergers. Judging him across the original TV series and the 2 spin-off films he has shown that he is clumsy at times, forgetful, and is non-verbal (except for the occasional word). He also owns a creative mind and has tackled problems with a unique approach (a very dangerous creative mind I must add). The major issue is he has shown incredible strong coordination and dexterity skills which works against him having dyspraxia in my opinion. I would say it is more probable that he is on the Autistic Spectrum. Ratchet and Clank is a successful and popular game series dating back to the early years of the PlayStation 2. Humour is one of the factors that make this series an enjoyable one to play, which does include moments of slapstick. When anything has slapstick as a premise a potential dyspraxic will need to stand out in order to be considered. In the second instalment of the Ratchet and Clank franchise a new character got introduced – Angela Cross. During cut-scenes, it shows that she is clumsy such as slipping, falling, banging her head, and other mishaps. Angela seems to get into more accidents than any other character making her stand out compared to them. If she had more character development with the same personality consistency then her score would be a few points higher, however judging her on the appearances she has had so far I’m happy with the score that I have settled on. When you have a character there is a good chance that they fall into a stereotypical character trait. One such typical trait is ‘The Klutz’. A typical klutz character is clumsy (go figure! ), plain and simple. Sometimes these accident-prone characters get a slight character boost by having something that makes them extra memorable; traits like inner strength, being funny, being the most friendly/caring, etc. Strictly speaking, the klutz is for comic relief; random, funny, and clumsy moments. Slapstick is a popular form of entertainment and it’s so easy to pull off. Typically that’s where this trope ends. You either end up with a loveable klutz who you want to root for or a character you dislike who you love to see get into accidents. Dyspraxia is a klutz character trope in real-life; we stumble, trip, and get into all sorts of mishaps and accidents. Dyspraxia is far more complicated than just a simple klutz trope. When these onscreen klutzes have an extra depth or have something compelling, especially if it’s something additional that we can relate to, then we can’t help but create our own head-canon for them. A theory that they could be dyspraxic, just like us! Funnily enough, Dyspraxia does get a mention under the ‘Real Life’ topic! Cassandra is a character from the popular fighting game series Soulcalibur, making her playable debut in Soulcalibur II. She is a bit clumsy and probably the most accident-prone character in the series – she has damaged at least two swords; one in Soulcalibur II and another in the sequel Soulcalibur III due to clumsy mishandling. The clumsiness doesn’t come across in game-play though, which heavily affects the final score. While she is a naturally talented fighter, she isn’t a trained one so to decide if the accidents are purely because she is a novice fighter or because of the clumsiness is difficult to tell – probably a bit of both. Personality wise, she shows fierce loyalty to those around her, especially for her sister, Sophitia. Her determination to succeed and her hard-working mentality with ample courage to do what she feels is right is unquestionable and as such, she can be considered as one of the purest characters in the series. After that, this analysis hits a standstill as there’s nothing else to really talk about without any more insight. Any game character we play as! This is probably cheating, but this page is just a bit of fun and shouldn’t be taken too seriously! When you think about it if you have dyspraxia and you play a game it automatically makes that character dyspraxic! From missing a platform to missing a target and from messing up a button sequence to getting lost (even with a map!). The character is a reflection of you! This is especially true if you’re playing virtual reality or something similar. I mentioned before that Tillie ticks off a few dyspraxia-type attributes, but not enough to suggest she is dyspraxic. I’ve included an analysis of Tillie here to show that even with certain traits of dyspraxia it doesn’t automatically mean a high score. Take this analysis as a basis for how I critique all characters. Tillie is an exceptionally hard-working, kind natured, enthusiastic, determined, resourceful, creative, and inspirational character. The film is just under half an hour long, so there isn’t time to develop the character or go into much of her back-story. She had a clumsy moment, but this was due to a sudden burst of anticipation and energy – an accident that anyone could have. I’ve also noted that in order for the steam engines to move it takes a good amount of coordination – something that doesn’t seem to affect Tillie even when compared to the other 3 steam engines. She is underrated by many of her peers and they constantly tell her that she can’t pull a train due to being too little. This kind of repression is rather similar to what we with dyspraxia have to deal with – just being told that we can’t or are unable to do something without an opportunity to prove otherwise. Because her treatment is similar to us with dyspraxia she gets a slight score boost. This page has been really fun to make and has been one of my favourite projects for my blog. With all the doom, gloom, and stigma I think it’s something positive to take a step away from all the cold facts of dyspraxia and concentrate on a warmer side. We know that most characters are not specifically created as dyspraxic, it just happens accidentally. Accidents and dyspraxia go well together! Sometimes a character is born and is given certain traits that we just see a part of us in them. Maybe a character was based on a real-life person with dyspraxia and those traits seeped through into them? On the other hand, maybe fate just smiled upon the creator that day to make such an awesome character that would end up connecting to us on a certain level. I look forward to hearing about other characters who you have found a certain dyspraxic click for. Thanks for reading!